Thanks to new digital technology, we are now able to take x-rays with less radiation than from older conventional equipment! In addition, this new technology generates images that are diagnostically superior to x-ray film. Retrievability and portability are also greatly enhanced. Environmentally safe, the digital x-rays require no developing solutions, fixers, cleansers, or x-ray mounts. Fischl Dental Associates utilizes individual digital sensors from Scan X Digital. 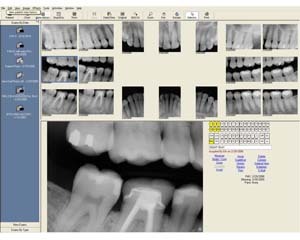 Superior digital images provide Fischl Dental Associates with valuable diagnostic information when designing treatment plans. If you have questions about digital x-rays, please contact Drs.Fischl for more information.